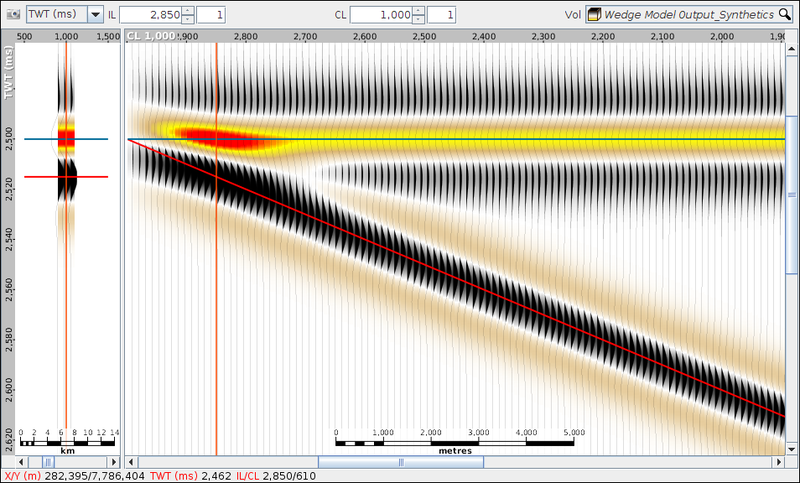 When evaluating thin beds or thinning sections, a wedge model can provide information on tuning effects. 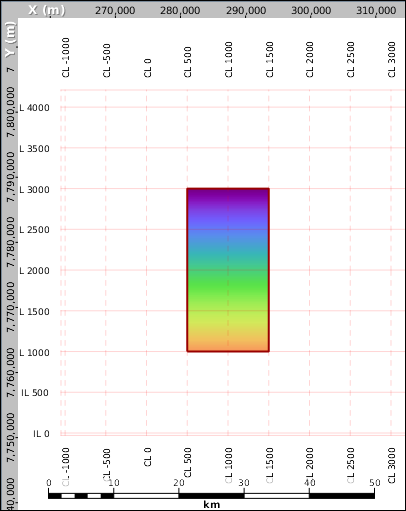 Tuning effects can be significant when the bed thickness is less than half a wavelength. In this tutorial, we will generate a synthetic wedge model based on some elastic properties and investigate the tuning effect of different bed thicknesses and wavelengths. Insight doesn’t include a Wedge modeling tool, but our workflow is extremely flexible and easy to follow. This tutorial requires the Base and Explorationist modules. With a 3D survey loaded in the session, open a Map View. Create an arbitrary 3D survey if you don’t have one. Right-click in the map and create a new polygon. Align the polygon along the inline direction. Take a look at the coordinates in the details of the polygon in Control Panel / Polygons. If you’re a perfectionist, edit the polygon point coordinates directly in the details panel! Remember the highest IL value, we’ll need that in a moment. Insight has some handy tools for building arbitrary horizons. We’ll use them to create the top and base of the wedge. In the Map View, open the Operations tab and choose Create Constant Horizon. Enter a value for the top of the wedge, in this case 2500 ms.
At Area, select the “WedgeZone” polygon. At Survey, choose the 3D survey and set the spacing for the model, e.g. 12.5 m.
Click Calculate, then Create to save the result as a new horizon. Next we’ll create the dipping base of the wedge. We’ll use the constant horizon we just created and a little horizon math to do this. Remember the maximum IL value from our polygon? We’ll need that now. 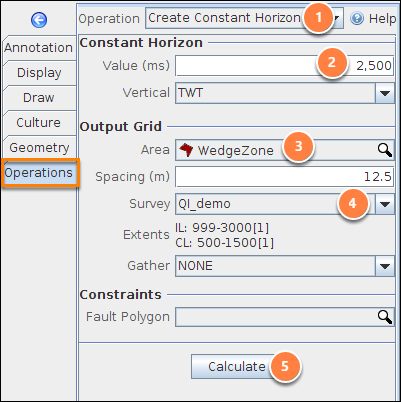 In the Operations tab in Map View, select Horizon Maths. At Inputs, click the Add icon and select the constant horizon. Ours is called “Wedge Top”. At Formula, type "h1 + (3000 - IL) / 10". This formula create a horizon gently dipping in the IL direction. Instead of “3000” use the maximum IL value from your polygon. ‘h1’ will contain the values from the constant horizon. The map view should look something like this. With our top and base defined, it’s time to create the window model. 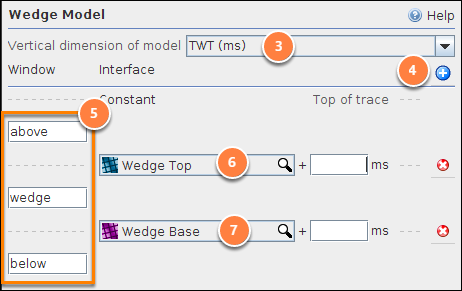 In Insight, Window Models are used to define layers in velocity and low frequency models. They can also be handy in Spectra Analysis. In the Control Panel, open the Model tab. Select TWT for the vertical dimension. Click the blue (+) twice to add boundaries. (see Creating a Windowing Model). This creates a model with 3 layers. By default, the model starts with “Constant Value” for the boundaries. 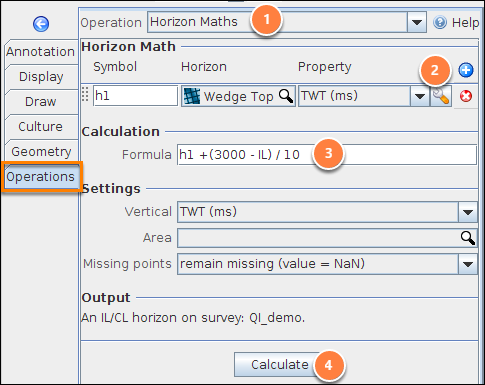 Click the first “Constant Value” field and select the Wedge Top horizon. 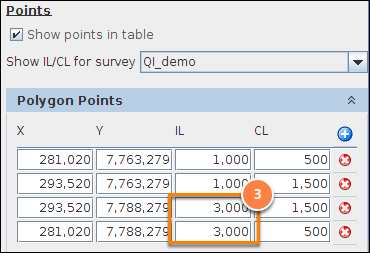 Click the second “Constant Value” field and select the Wedge Base horizon. Our model is ready to go. Time to fill it with values! In the Control Panel, open the Wavelet tab. Set the frequency to 25. To create a realistic wedge model, it’s important to determine relevant P-Impedance, S-Impedance and density values for the interval that you are modelling. If you are lucky enough to have well data available, you can use it as a guide for populating the wedge model. In the Control Panel / Process tab, add a new “LF Model (simple kriging)” process. Name it “Wedge Model Output”. 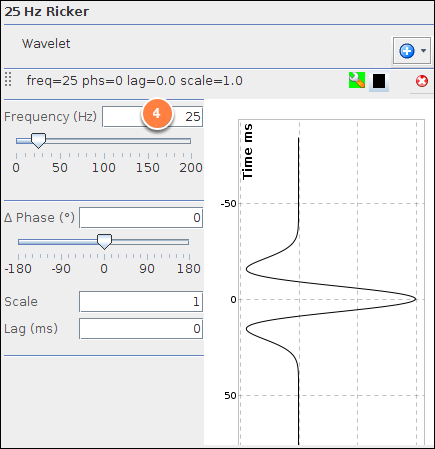 Select your “25Hz Ricker” wavelet and set the angle of incidence to 0. Adjust the output extents to match your polygon area and top and base wedge horizon. You’ll need to cover the full inline extent, but can trim the crossline extent to a thin strip. Finally, in the section “Optionally override layers with constants”, enter the elastic properties for your lithology layers. The process will output four volumes: the P-Impedance model, the S-Impedance model, the density model and the synthetic result. Let’s open an IL/CL view (View menu / new ILCL view). Go to the location of the wedge (refer to the extents in the Wedge Model Output process to find it). 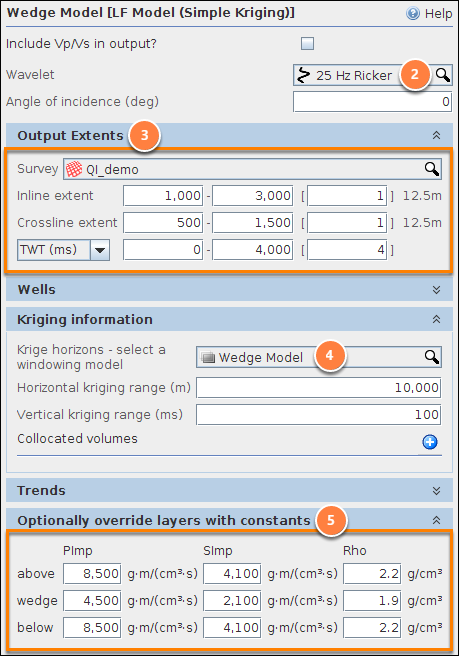 Select the volume “Wedge Model Output_Synthetics”. 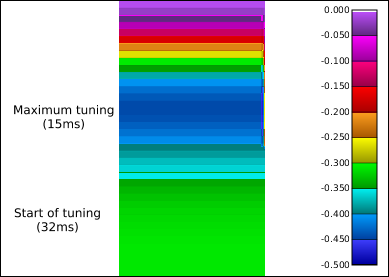 We’ve added some measurements to note maximum tuning thickness of the interval. 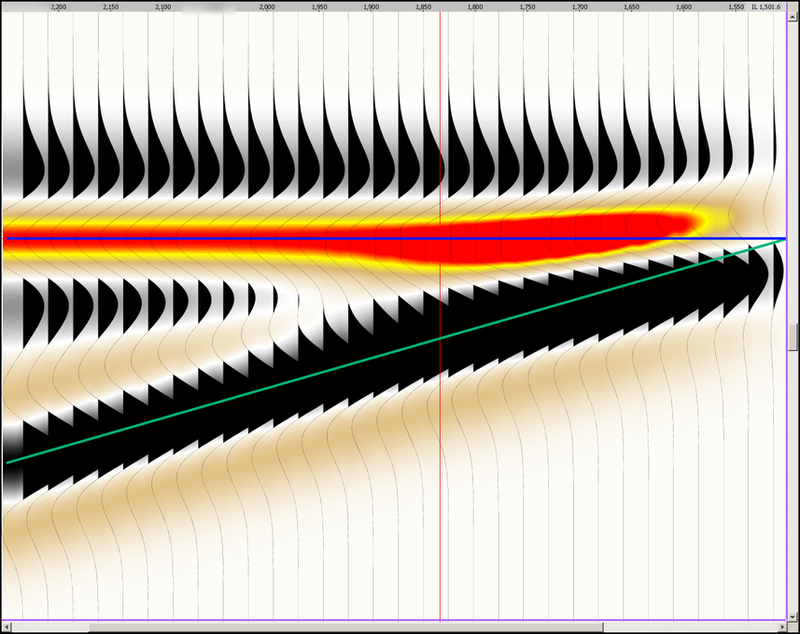 Because this is a volume, we can also look at the extracted amplitude of the top horizon in the map view. This is interesting! We’ve shown that for this set of lithology properties, a 25Hz wavelet, and a zero angle of incidence there is a 50% increase in amplitude. We’ll keep that in mind in further investigations. To compare different model results, simply make a copy of the process and make changes. Remember, because everything updates on the fly, you can change any of the parameters to investigate their effect.